Baccarat is a famous card game, but in comparison to Blackjack it is mostly game of chance. Of course, it has certain rules; however, there is no basic strategy, as for example, card counting in blackjack. The result of the game depends on the value of cards. It is simpler than any other card game. 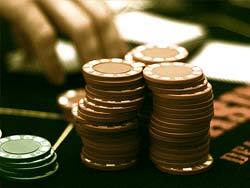 Baccarat online doesn't differ from Baccarat that is played in land-based casino. Each gaming table has three sectors where to bet: Player, Banker and Tie. Players can make their bets either on one or two sectors with the exception of Player-Banker. The amount of points depends on the value of cards: Ace has 1 point; Queen, King, Jack and 10 -have zero; all other cards are ranked according to their nominal values. Each winning bet has its payoffs. Player's number of point is more - Player bet is winning as 1 to 1. Banker has more pints - banker bet is winning in correlation 1 to 1. Moreover, 5% commission is paid in favor of casino. Player and banker have equal number of points - Tie is winning and bets are paid off in correlation 9 to 1. As statistics shows, the advantage of casino on Banker bet is 1, 17%, on Player - 1.35%, but this wager assumes 5% commission. Tie has the highest value for casino. It is not difficult to draw a parallel and make a conclusion that bet on Player is more efficient for gambler than two other bets.